STS Online | Southern Tool Steel, Inc. I forgot my password and/or user name. You can reset your password under the Log In section of the site. Follow the instructions to receive an email with information to help you reset your password. If you forgot your user name, contact us at 1-800-487-6382. What features are available if I sign up for an account? Order Status – customers can check the status of orders entered online as well as orders entered by a STS rep.
How do I save an e-Quote? 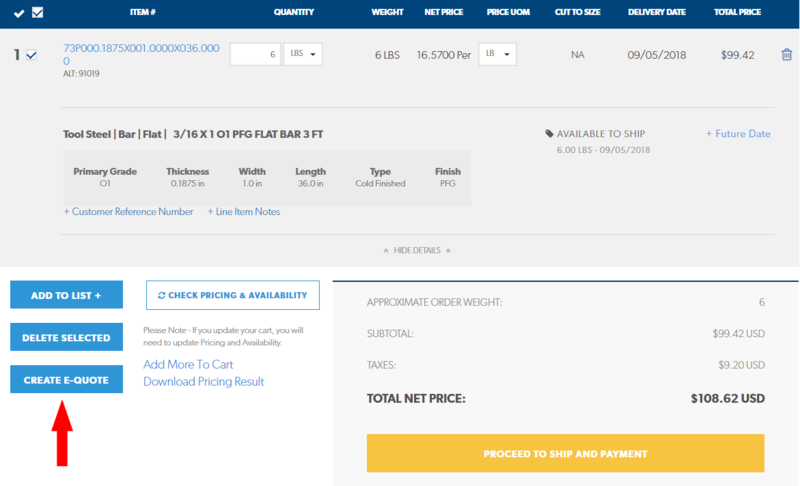 Once you get current pricing, whether in the Cart, a Shopping List, or Quick Part Search, there is a blue “Create E-Quote” button. After clicking this button, a popup appears allowing you to name your e-Quote. Finally, click the “OK” button and now your e-Quote will appear on the Quotes page. Can others in my company order an e-Quote that I have saved? Yes, if that person is either a Customer Administrator or a Buyer they can order an e-Quote that was created by a different user. Customer Administrators, Buyers and Inquirers have the ability to create e-Quotes. Why can’t I save what is in my cart to an e-Quote this time? You are unable to save a e-Quote within your cart if material is out of stock. 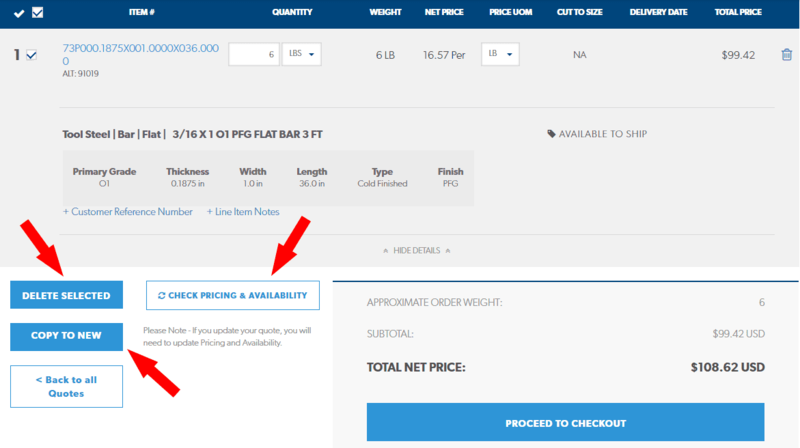 If after running a Pricing and Availability within your cart, there is a TBD shown the items cannot be priced at this time. Because a price cannot be determined, you will be unable to save this selection as an e-Quote. How do I see the saved e-Quotes on my online account? Click on “Quotes” in the menu. From the Quotes pages, your saved e-Quotes will appear within a list. 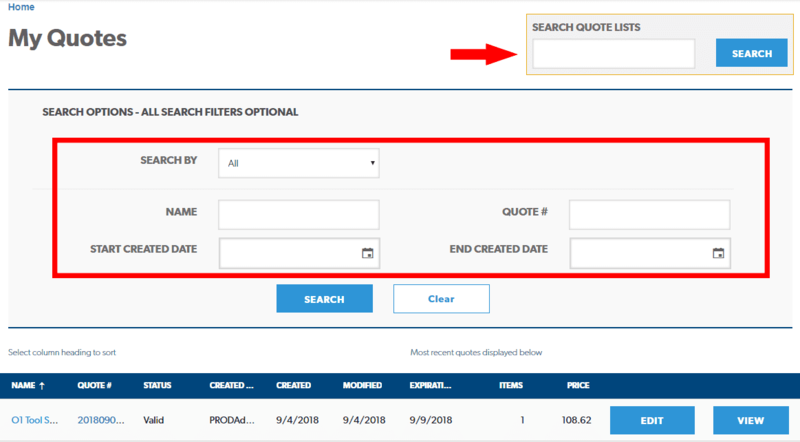 To quickly find a saved e-Quote you may search for it by: Name, Quote Number, and Start Created data and End Created Date. How long is my e-Quote good for? You can see your e-Quote expiration date on the quote header page or on in the e-Quote. What is the difference between a “Shopping List” and a saved “e-Quote”? A shopping list is a list of parts you can save to make future, repeat purchases quickly. However, a shopping list does not hold a price for the items, you must recheck for Pricing and Availability on these items each time you make a purchase. An e-Quote however, saves the price on the items for a limited time, allowing you to purchase with a saved price. Why did I lose my prices on my e-Quote? There are several reasons why you may have lost your price on your e-Quote. Your e-Quote may have expired if it is older than 5 days or it is the start of the new month. If you add your e-Quote to your cart and there are already items within the cart, your e-Quote price will become invalid. How do I search for my e-Quote? First, click on “Quotes” in the menu. Once you are in the Quotes page you can search for your quote by: Quote Name, Quote Number, and Creation Date. You may also use the Search Quote Lists box, in the upper right-hand corner of the page, to search for your quote. You can filter your search results by: All Quotes, Valid Quotes, Expired Quotes, Ordered Quotes and Invalid Quotes. I have other items in my cart, Can I add an e-Quote to my cart and keep the quoted price? No if you currently have items within your cart and add an e-Quote to your cart a popup message will appear informing you that your pricing may change. The price associated with your e-Quote will no longer be valid if you add it to the rest of the items within your cart. What is the difference between edit and view mode? Within the edit mode, you can select either all the items within your e-Quote or just certain items by checking the box next to the item. After selecting your items, three new options become available. You can now: delete selected items from your e-Quote, copy your items to a new e-Quote or check the pricing and availability on the items. I am the Customer Administrator for my company. How do I add a new user? Go to Manage Users and select Add. Complete the user profile – we suggest using the person’s email address as their user name. Customer Administrator - Has full use of the site. Can create and distribute user names and passwords and update employee information, including deleting/adding employees and security role changes. Buyer – Able to enter and view orders and create shopping lists. Inquirer – Can view orders, shipping history, stock status and pricing. May not place orders or view user information. Consumer – Able to view stock status only. May not place orders, view net price, order status, or account information. Order Status - View stock status only. Select Reset Password to send new user a log in notification email. If you are an Account Administrator, you have the ability to add your colleagues to the site, as well as remove them. Select Settings from the menu. Within the Settings page, select Admin from the right side of the menu. Click on “Manage Users” on the left-hand navigation section. Search for your employee. Once you have results, click the “Edit” button and then click on the Delete button. Our previous Customer Administrator is no longer with our company. How do we get a new customer administrator set-up? Please email our customer service department by emailing us at shop@southerntoolsteel.com or contact us and provide the name, email address and phone number of your company’s former Customer Administrator, as well as the name, email address and phone number of your new Customer Administrator. Can I set a default Unit of Measure (UoM)? First log in to your account. Next, click the Account dropdown menu next to the cart in the shop.southerntoolsteel.com header. Select Change Default UOM. You will see the default unit of measure is automatically LBS. You will now see your new UOM default selections in our catalog. Can I order on a credit card? Absolutely! We accept VISA, MasterCard, American Express and Discover. How do I change the ship-to address on my account? Select Shipping Options from the cart. The address highlighted in blue is your default ship-to address. Select the alternate pre-registered shipping address where you’d like your order delivered. Note: Only your first four ship-to addresses are visible in the dropdown menu. Select Show More to see a full list of your pre-registered addresses. Call us at 1-800-487-6382 or contact us to register a new shipping address or adjust an address on a current order. Note: It may take up to two business days for newly registered addresses to appear under your online account. Can I view pricing and/or availability on items without adding them to my cart? Under the Catalog tool or in Recent Purchases, enter the quantity you would like, and select the Check Stock button. Under Quick Part Search, enter the part number(s) and quantity of items you’d like to order and select “Add” or “Add More” for each item. Then, select Check Pricing and Availability. Once a shopping list is created, mark the check box next to the items you would like, and select Check Pricing and Availability. Express checkout makes it faster to submit your order. After adding an item to the cart, you will see the Express Checkout button as an option. You can also access express checkout by click on the cart icon and selecting Express Checkout. What is the difference between Express Checkout and Go To Cart? Go to Cart is the standard way to checkout. From there you can receive pricing, delivery dates, and material availability. You can go to the shipping tab and select your drop ship locations, add delivery instructions and enter credit card info to place orders. The next stop would be the submit order screen where you enter your Purchase Order number and review your order before submitting it. Express checkout fast forwards you to the submit screen. You will receive pricing and material availability. Then enter your Purchase Order number and click submit. Did you click on Express checkout by accident, or do you need the delivery date before making a decision? Just click on the Review order icon at the top of the screen and you can proceed through the standard Go To Cart screens. I placed my order, what next? Will my existing Southern Tool Steel sales representative be able to see my order? Yes, your Southern Tool Steel sales representative will be able to view your order in our standard system. In addition, you can allow your sales representative to receive an automatic copy of your sales receipt. To allow your sales representative to receive a copy, add them to your default email confirmations. You can locate this by selecting My Settings under My Account. Enter the email address of your sales representative, as well as anyone else you’d like to receive a copy of your sales receipt, under the Additional Email Addresses box. How can I access a Mill Test Report? You can view mill test reports under the Order Status section for any order placed with Southern Tool Steel, including both online orders and those placed directly with a sales representative. The test report link will appear for each item once the order is completed and shipped. Select Order Status from your menu options. Search by your Purchase Order number, your Part number, Transaction number, Southern Tool Steel Sales Order, or by Date. Next, click on the Southern Tool Steel Sales order to review the details of your order. How do I duplicate my order? In the Order status section, once you have located your previous order details, place a check mark in the line item box you’re interested in, or check the “Select All box, then, just Add to Cart. Can I change my order after I submit it? Once you have submitted your order online, you no longer can make changes to that order through the website. You can utilize Live Chat to speak to a Southern Tool Steel representative or click on the “Contact Us” link at the top of the webpage. We would be happy to make any adjustments needed! What items can I cut on southerntoolsteel.com? How can I sort for items that I can cut in the Southern Tool Steel catalog? On the left side of the screen there is an option to select Cut To Size. By Clicking on that feature, the items will narrow down to items that offer cutting as an option. How can I tell if an item can be cut on southerntoolsteel.com? Not sure which process or finish to select? Can I change an item to be cut after it is in my cart before I submit my order? Absolutely! 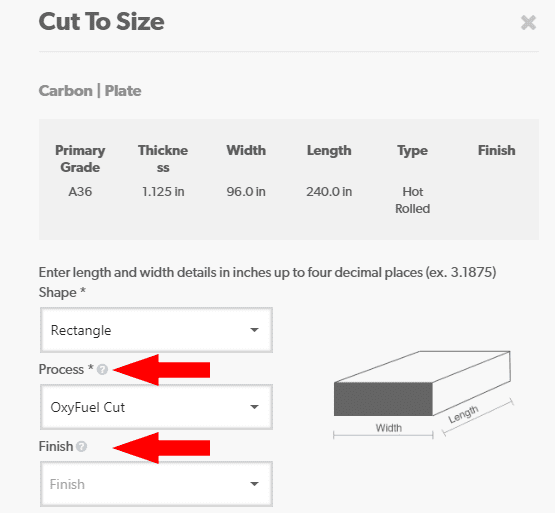 Just click on the cut to size box on the right side of the item and it will activate the cut box for you to add your cut specifications. Click here to request a product brochure.